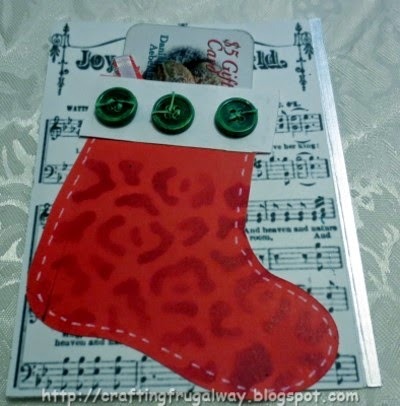 I saw in a book a simple card with a stocking on front and got to thinking that if the stocking was large enough it could be used to hold a gift card. After a little bit of trial and error I managed to get the stocking large enough to hold a gift card but still fit on an A2 card. The silver trim on the edge of the card doesn't really show up in the photo but I took a silver paint pen to draw a line. I used for my background a piece of sheet music that I scanned a few years ago. I used a stencil on the stocking and airbrushed with a marker. I then took a gel marker and did my faux stitching around the stocking. I didn't have any buttons the right color so I went and brushed those and the scrap floss with an air brush. I took a piece of ribbon for the loop at the top of the stocking. Here it is with a gift card inside. I normally don't do gift cards but with the price of shipping things it is more practical if you want to give something to someone who lives out of town.. Also sometimes it is nice if the receiver can pick out what they want. For example every year I buy my grandchildren books but I thought they might have fun picking out their own book for a change this year. Do you give out gift cards? I plan to be working on more Christmas cards so do come back. 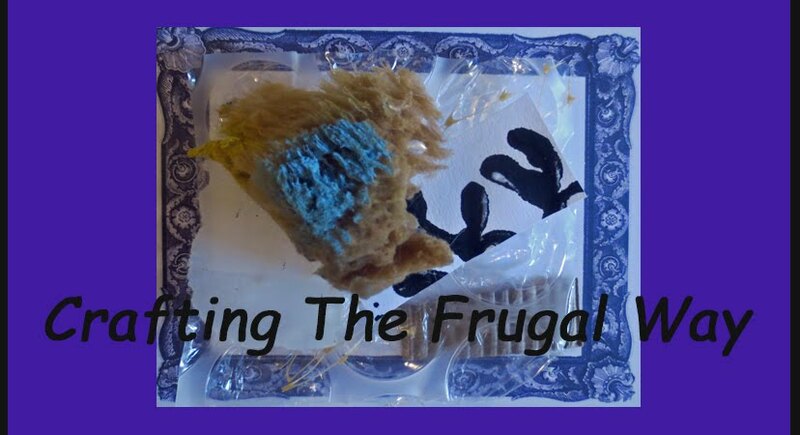 Wishing you Happy Frugal Crafting till we meet again! Hi everyone I hope you are having a wonderful week. 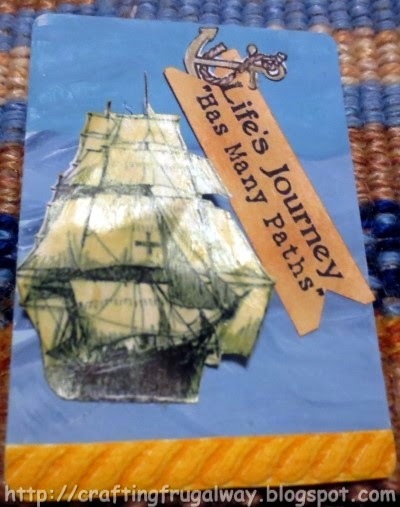 Yesterday I had fun using my e-Brush on a balsa wood shape as well as using a stencil and heat embossing. Unfortunately the photo does not do it justice. I need to buy something to seal it with and then I'll glue a pin back on it. If my granddaughter wants I have plenty of balsa wood shapes which I bought a couple of years ago at Dollar Tree so she can make some pins, barrettes,or ornaments for Christmas gifts. First I used my eBrush and did the background as well as edging it. Then I masked off all except for the body section of the butterfly and airbrushed. Then I masked off the body and airbrushed using a stencil on one wing and then flipped the stencil over and did the other wing. 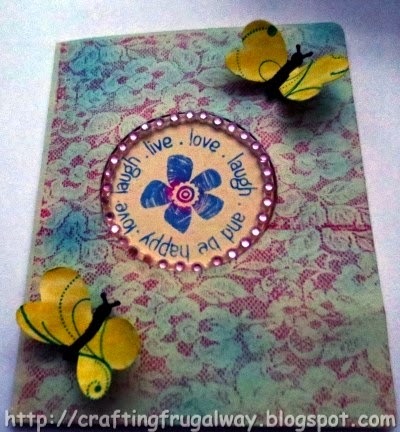 Then I took a circles stencil and using an embossing pen embossed some of the circles with Zing gold embossing powder. Then I took Shimmer Creative Medium and with a cosmetic wedge applied it all over the front. Next thing I'll be doing with the eBrush is to do some buttons for on a card. If I can find my small stars stencil I'll stencil a star in the middle. 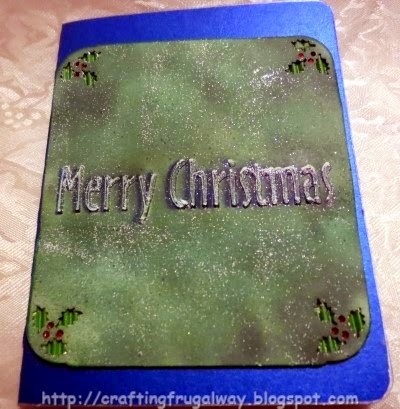 If you have not tried using a stencil for heat embossing you might want to try it. 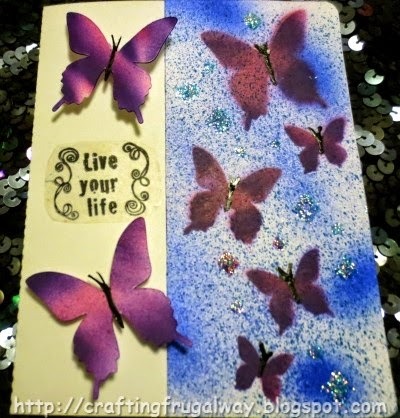 Use either an embossing pen or embossing liquid with a dauber. Then lift up carefully your stencil and add your embossing powder and emboss like regular. Thank you for taking time out of your busy life to visit. Wishing you Happy Frugal Crafting till we meet again! Hi everyone another week has started but this week there is no altered card challenge as Claudine had surgery. I thought since there are no cards to do to go ahead and play. You know I like to experiment so I decided to see if the texture medium I found would work with a metal embossing stencil.. Of course I also wanted to play with my airbrush. At first I was not pleased with the card and in fact was ready to throw it away. Then I decided to see what I could do to turn it into something which I liked. The card base was cut from a piece of shimmer cardstock. I normally don't like to use it because the white core shows where it has been cut. This time though since I had planned to ink the edge with silver I went ahead as it really makes my panel pop. I took a scrap from a print and cut and put a Lasting Impression metal template on it. I could not find this template anywhere but I did find a Curly Merry Christmas template which would work by Lating Impressions. I carefully covered with scrap the places I did not want to get the texture medium on. I carefully lifted the template after I was through applying the medium. When the medium was dry I went and put my template back down. I once again masked this time where I did not want to get ink. I then used the Spectrum Noir blue marker which came with the airbrush. I didn't get the template exactly where the texture medium was but I love the shadow which I got. I then took my eBrush and used two different colorss of green. I wanted a mottled look so in some places I keep going over and over until it was darker. I then used a white embossing pad with a cosmetic wedge. I applied Stampendous Winter Wonderland embossing powder but then took a bristle brush and brushed most of the embossing powder off before using my heat gun. 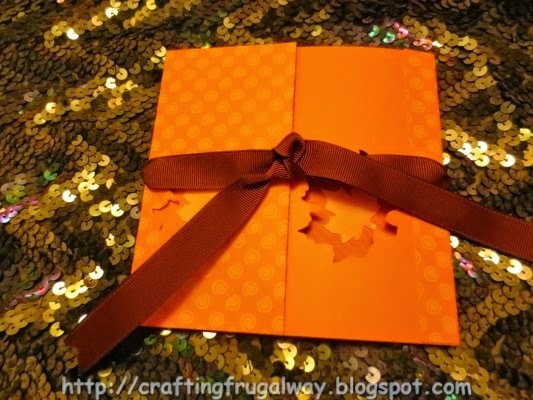 After using the heat gun melting the embossing powder I once again put the template down. Then this time I put the template back down and got it where it originally was when I applied the texture medium. I then used my gel white pen to trace around the letters. I don't remember who makes the holly rounder punch but I used it on the corners. I then backed the panel with green corrugated cardboard. I used a red glaze pen to color the berries. I love how the corrugated cardboard adds a nice texture. I'm going to keep in mind using corrugated cardboard behind cutouts. To finish the panel I edged with Colorbox green. Which covered the brown edges as well as added definition to the panel. That is all for now. Thanks for stopping and do come back. Wishing you Happy Frugal Crafting till we meet again! Hi everyone I should be cleaning and organizing around my apartment as there is going to be an inspection on Monday. However, the mad experimenter came out and wanted to play with the eBrush and markers. What can I say it is more fun to play than to clean any day. LOL! I decided to try out the eBrush on tissue wrapping paper. Since I was just playing I did not use painter's tape to put the stencil down tight. When I went to look for the cap to the marker I moved the stencil a little bit and could not get it aligned back up. I used three different marker colors. I liked how it turned out so went ahead and used liquid pearl for the dots. I love the softness airbrushing on tissue paper. I'm thinking this stencil moved a little bit after applying the first color would be pretty done on a scarf. I did a print and cut sentiment but decided to not use it. However, I did play with using the airbrush with lace as a stencil and like how it turned out. I also liked the fact that using the airbrush did not smear the inkjet ink. Then I got to thinking that I could color beads with the eBrush. Taking a piece of recycled packing Styrofoam I pinned the bead down. The first bead I did was purple but decided that it was better to have a little bit of contrast. I took a piece of crotchet thread and tied the bead on the end of the ribbon. I'm back to trying to turn chaos into order and having the apartment a little cleaner by Monday. At least the weather is not beckoning me away. Although yesterday I did take a long walk and enjoyed the Autumn foliage. Hi everyone! I can't believe that we are already in week 8 for the altered card challenge. What a fun challenge this has been. 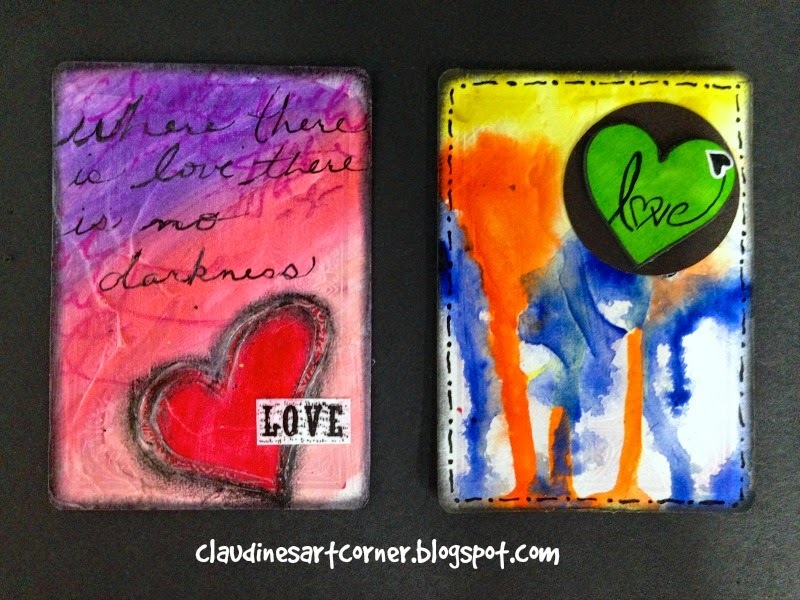 This week the theme is love and Claudine broke out the gelatos and watercolors. Well I discovered that it has been so long since I used my tube watercolors that most of them were dried out. I will have to open up the tubes and put the dried pieces in containers to re-hydrate them. I also found a tube of texture medium from a couple of decades ago so decided to experiment. Here is my experiment with the texture medium. Instead of using gesso as the base for this card I applied the texture medium. I love how it ended up cracking in places I also took a dried up ink pen and used the point to draw my heart. Promise no laughing about my drawing of the heart. Like Claudine I took out my gelatos and scribbled and then sprayed water. I then took a bristle brush like you would paint trim with and brushed over my colors blending them in. I also used a gelato to color in the heart. I then like Claudine used a black oil pastel to outline the heart smudging it. I was not totally satisified with the look though so went back outlined with a black glaze pen. I played around with using a tag with love like she did but didn't like how it was looking. I even tried writing on ribbon but it was no go. I then tried to stamp a heart inside but my ink was too light of a color.. I finally took a piece of wide ribbon and stamped on the wrong side of the ribbon using Stazon ink. Then cut out the heart. If you saw my handwriting you would know why I decided to use a stamp instead. I was afraid I would not get a clear stamp stamping directly so I used a piece of plastic.Alas my black archival ink does not work on plastic. I didn't like the brown Stazon and the purple blended in to much so I ended up using the teal blue. I used a dab of white glue on each of the corners of the plastic and you really have to look hard to see the glue. I thought stamping on paper would be too intrusive. This way you can see the delightful texture and colors. When I saw the theme was love and hearts I thought this card would be perfect to use. 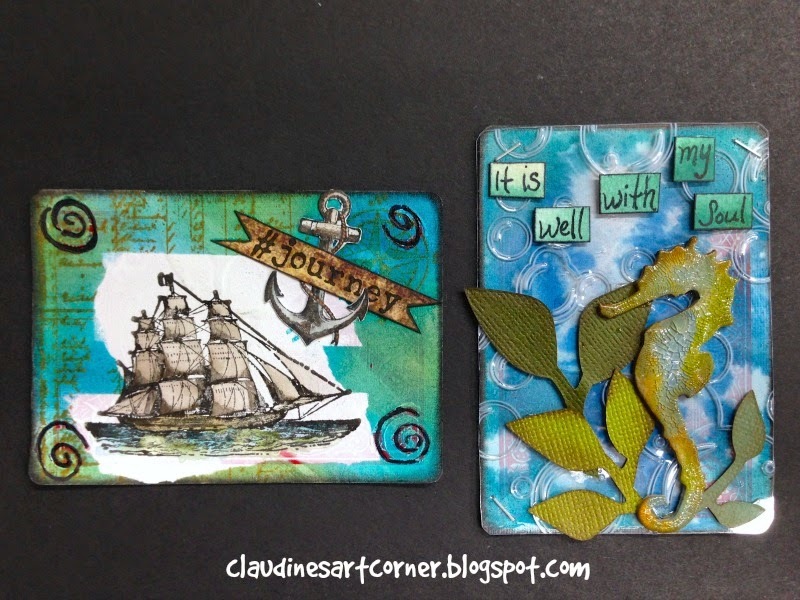 During week one while preparing my cards for the challenge I had experimented with gesso and stencils. 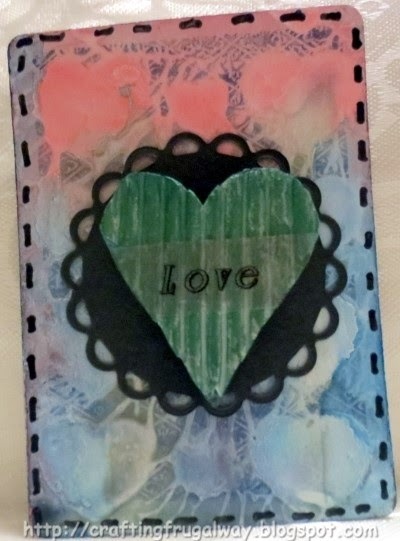 I love how using a stencil with lots of hearts turned out. As I said my tube water colors were dried up. I did manage to find a Vermilion, Prussian Blue, and a Peridot metallic one that was not. After adding water to the paints I brushed on and dripped I have never dripped water colors before but love the way the colors blended. Recently I was going through a box of craft things and there was a green corrugated box I bought at a thrift store for a quarter.. I cut my heart out of that. Lol as you can see I can cut hearts out better than draw them. I used the leftover Peridot paint to soften the color and give it more of a metallic look. The love is printed using my label maker and clear tape. Taking a piece of black paper from the inside of a page protector I cut out my circle using a die. I then took my black glaze pen and did my stitching. Lol! some of the stitches are crooked but if I was stitching by hand it would be the same way. I also edged the card with black archival ink but it does't really show up in the picture. One thing about doing this challenge is it gives me ideas for doing regular greeting cards. Also it gets me using supplies that otherwise might be gathering dust or like the water colors deteriorating. Luckily unlike acrylics or oils they can be revived. Thank you for stopping by. I'm off to make more Christmas cards which are in the works. I would like to get a box full mailed out next week for the Caring Hearts Card Drive. Hi everyone! 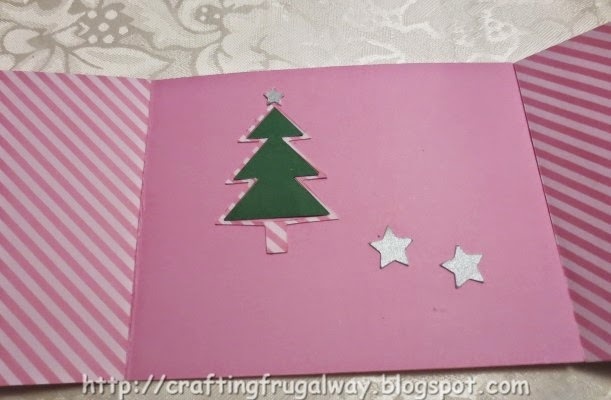 Recently I was through a cardmaking book before I took it back to the library and there was a popup Christmas tree card. I'm looking at the card and I start to think that it is deja vue. 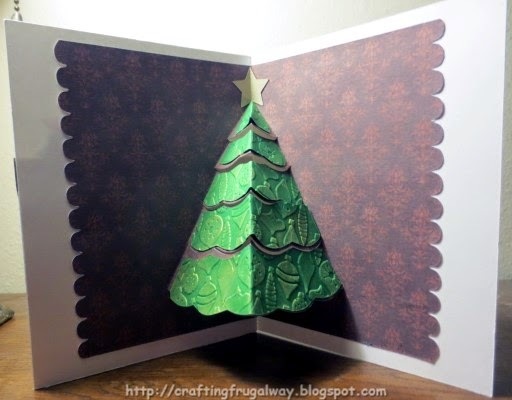 Yes, it sure was as I made a popup Christmas tree card back in 2012, Of course I had to go back to my blog post to see who created the cutting file. I made some changes to the file but the original file was done by Debbi the owner of Paper Pulse. I decided to do the front of my card along the lines of the card done in the book. 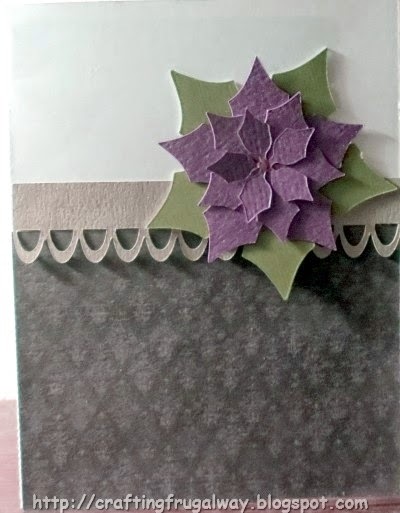 I could not find my Christmas cardstock not that I had that much of it to begin wish so I used digital pattern paper from a cajoline collection. The colors looked red in my software but when I printed it was a different story. My lighting is terrible in my craft room. I also thought I had a red color paper to cut out the poinsettia but that was not the case. I used my yellow glaze pen to make a center in the poinsettia. I figured out how to move the tree down so that I could add a star on top. It took me some doing but after releasing compound path I was able to copy the tree so that I could change fold lines into solid lines. Then it took me tracing that tree so that I could separate the pieces.I wanted to emboss just the tree part not the whole panel. I must have accidentally resized the tree when I moved it down as my embossed pieces were smaller. 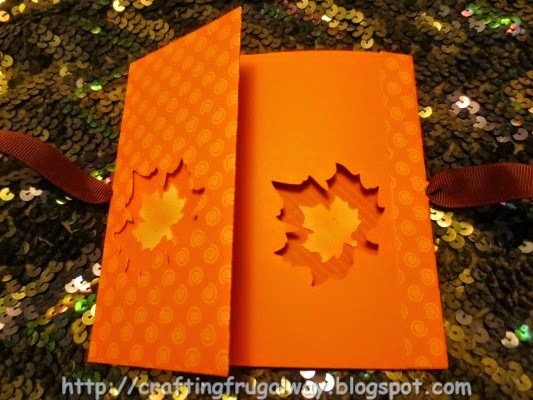 I embossed using a retired Sizzix ornament folder. After embossing I rubbed a light amount of Inka Gold over the tree strips. It doesn't really show in the photo. Do you think it would be too much if I added presents on both sides like the card in the book? Or would you leave it like this and maybe add a sentiment on the right hand side? I'm thinking next time I make this card I might emboss some pattern paper. Since this card goes together so quickly and is not bulky I thought it might be fun to make some for the Caring Hearts Card Drive. 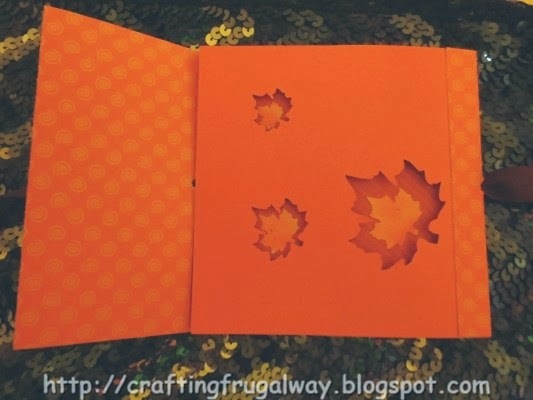 Do you like to make popup cards? Well tomorrow is another altered card challenge. Once again I'm totally clueless about what it might be. 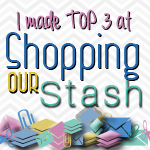 Thank you for stopping by and Wishing you Happy Frugal Crafting till we meet again! Hi everyone I thought I would share a Christmas card today. You may remember I was playing with the template that Jenn Mason shared on episode 401 at scrapbooksouptv.com .I had replaced the flowers with a maple leaf. This time I decided to replace them with a Christmas tree and stars. I didn't like the way the ribbon was attached to close the card so I changed that on this card. 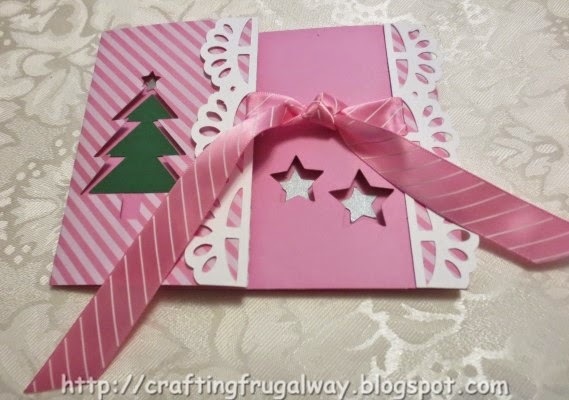 I don't normally craft in pink but I don't have a lot of double sided cardstock. When I saw this pink the diagonals reminded me of candy canes. Also I just happened to have ribbon that coordinated with it. The ribbon had caught my eye in a clearance bin and although I didn't know what I was going to do with it I bought it. Originally I was going to make a loop of ribbon and put a button which had a star on top to close the card. However when I saw this ribbon I decided to put a border on both sides with ribbon pulled through to make ties. My border was too wide so I cut it narrower and it still was too wide so I decided to glue the straight edge as well as put the ribbon through on that side. 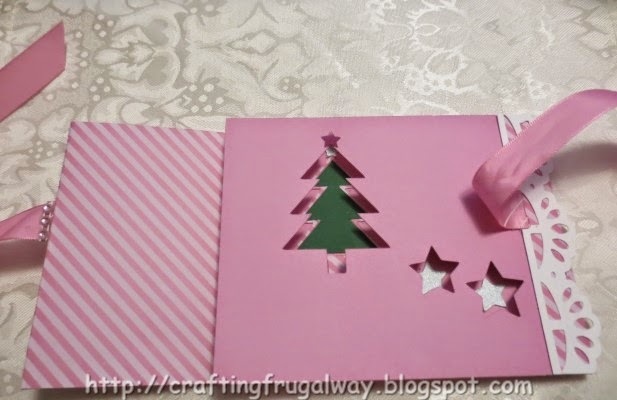 The trees and stars are cut out of scrap paper. As is the border pieces. The tree, stars, and border are all Silhouette cutting files. Opps! I forgot that when the card was opened it would show where I adhered the ribbon on the left hand side. Gem ribbon to the rescue. I had cut the piece for inside the card too small as the tree is taller than the flower in the original file. Instead of cutting a larger piece or even using something else I decided to forget putting an extra piece inside. Instead I glued down the tree frame which was left over from cutting the front and then glued in the middle piece. For the star on top I cut out a small star and glued on the frame. 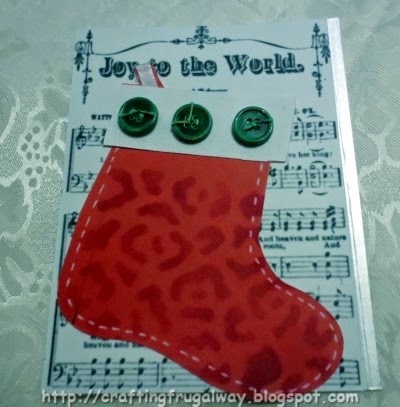 Later on I'll stamp a sentiment inside where it won't show when the card is closed. Yesterday was a rainy day so after going thrift store shopping I worked in Silhouette Studio designing cards. I saw the cute Pilgrim children image in my stash of digital images and although it is really low resolution I decided to go ahead and use it. The background paper was an experiment which was a dud. I think I should have tried it with a darker tea. I took tea leaves and sprinkled them on the paper and then sprayed with a color mist I made using butterscotch alcohol ink on a scrap of vanilla cardstock. If you look carefully you might be able to see where the tea leaves were. 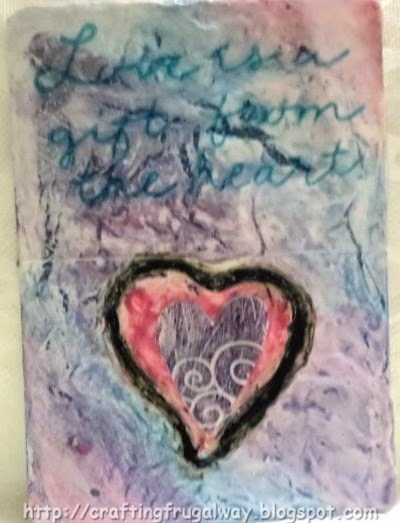 When the cardstock was dried I heat embossed using a hero art stamp. Then painted the leaves with metallic watercolor. I had to use two different pumpkin files to create my pumpkin in Silhouette Studio for my sentiment. By combining and filling in with color I was able to create a print and cut pumpkin. LOL! I'm too cheap to spend a dollar on a file in the Silhouette Store. Three years ago I scanned in the sheet music to use on a Thanksgiving card. After Cameron cut out the sheet music and pilgrim children I went ahead and edged them with Vintage Photo Distress ink. I used adhesive foam squares to adhere the children..
Another experiment which was a dud was trying to make frost background paper. Don't know when the book was written but it must have been before frost free freezers were in use. I didn't even get ice crystals to form using plain water. Guess I'll have to wait until cold weather when I can put my painted paper outside. Have you tried any experiments? If so were they duds or were they successful? Off to listen to music and craft some more. Talking about music did you know that most libraries have CD's you can borrow? This is a great way to listen to different types of music and artist s without putting out the money for a CD only to discover that you don't like the music. Hi everyone it is Monday and that means a new Altered Card challenge has begun. By the way just because it is week seven doesn't mean you can't join us. Feel free to jump in and join the fun. This week the theme is sea. It was only when I finished my cards that I remembered I have some fish and ocean stamps. I sort of did my cards along the line of how Claudine did hers. I decided to use a card that I had played with adding laundry bluing to gesso. I did mask off the bottom of the card with painter's tape and apply Broken China Distress ink to the top. The ship is a Dover Sampler image which I applied Vintage Creative Medium over. I didn't have the paper that Claudine stamped her sentiment on. After stamping with Black Archival ink I used tea dye and antique linen distress ink. to color my white copy paper. You would think that I would have had an anchor image in my tons of images but I had to go looking online for a free image. I colored with metallic color pencils. I saw a piece of embossed wallpaper on my desk. I decided to cut out what looked like rope. Then I painted it with Wild Honey Distress paint. The background for this card I had applied gesso and then placed bubble wrap on top. I painted it with Broken China Distress Paint and spritzed some Splash Mister Huey on top. 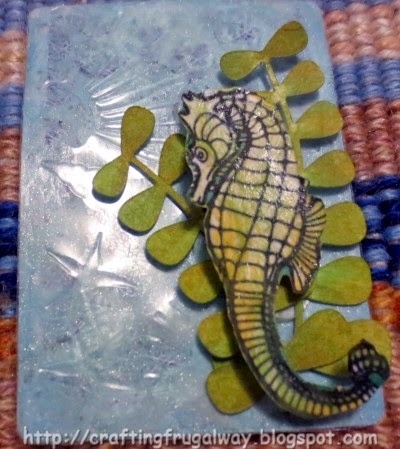 I didn't have a bubbles embossing folder so I used a Existencil Shell stencil. to emboss my plastic. I applied Shimmer Creative Medium to my card and then put my embossed plastic down. Shhhh! Don't tell anyone that I accidentally put the plastic down with the debossed side up. 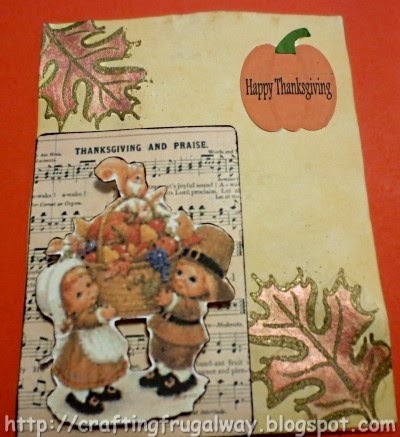 I cut the leaves with my Cameo and then colored them with Distress paint and Distress ink. I attached them to the plastic with a clear Zot. The sea horse was part of a Dover Sampler image. After I did a print and cut I colored with Distress Paint. Argh! I went to use my crackle distress paint and it was dried up. To give texture I used Glossy Glazon and while wet placed a crinkled plastic bag in the wet medium. He is pop dotted . I decided since the plastic was so pretty to not use a sentiment. That's all folks! I have several projects in the works so hopefully I'll be crafting and posting some more real soon. Wishing you Happy Frugal Crafting till we meet again! It has been a rainy day so a good day to play and experiment. This time I decided to print my photo on watercolor paper. I bought an off brand watercolor paper on sale and it is awful so like the grey cardstock I accidentally bought I'm trying to use it up. From now on although it may be more expensive I'm going with a known brand. 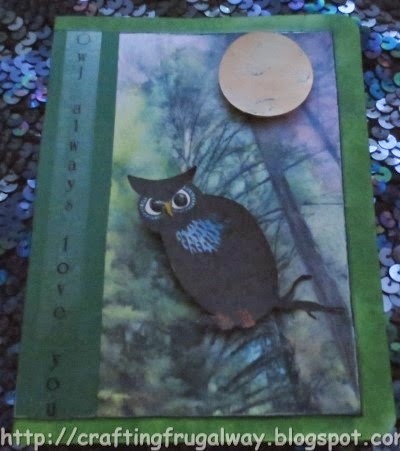 I was having so much fun with the owl that I decided to make one more card using the owl and moon. Nothing says you can't use the same images and if they are already traced for print and cut you might as well. 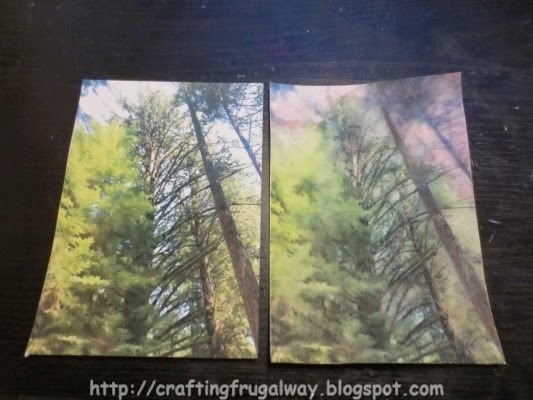 The image on the left is the original photo printed on watercolor paper. The one on the right is colored with watercolor pencils and a wet brush. also printed on watercolor paper. Because it is printed with an inkjet printer the ink bleeds giving I think a nice watercolor look. My brush was a little wetter than it should have been when I first started on the right hand corner with my pink. The yellow I used didn't really show up. Besides using a wet watercolor pencil and then brushing water over I also used just clear water in places. You want to continually rinse your brush out as it will pick up some of the inkjet ink. Otherwise you will end up with a muddy mess. LOL! Although that might be what you are after. I took Forest Green Stazon ink and a cosmetic sponge to paint the border on the card base. Alas the ink pad was pretty dry so time to order reinker. I then took Cactus Green Stazon ink. The two inks did give a nice mottled look. I used silver and black ink to edge the panel. After it was adhered to the card base I then went back and drew a fine line around the panel on three sides with a green glaze pen. The moon and the owl were embellished exactly the same way as in the previous post. I really love the way that the Dimensional Magic adds to the owl's eyes. This time I did put my sentiment on a piece of scrap cardstock left over from cutting out the base for the previous card. There you have it a way to turn a photo or image into a faux watercolor without using expensive software. Later on I'll be using this technique with some floral photos I've taken over the years. In the meantime my craft area is begging me to clean it up and organize more. Who knows what treasures I may find. I already found some stamps that have never seen the light of day. Do you use watercolor paper and is there a particular brand that you prefer to use? By the way even if you don't use this technique watercolor paper gives a nice texture to the image you print on it. Of course if you know me you know that I like to add texture and dimension to my cards. Once again I don't know what supplies or what the theme will be for altered cards so you will have to come back next week to see what I do. Wishing you Happy Frugal Crafting till we meet again! Hi everyone I'm having beautiful weather but alas the rain is suppose to come next week. I took some time to flip through a book I checked out of the library about creating decorative papers. One of the first examples was a photo printed on photo paper and then oil pastels and water was used to give it a watercolor look. That got me to thinking if I could color a portion of a photo that way. Well the cleaning and organizing fairy has not shown up and alas my oil pastels have gone AWOL I. I decided to try gelatos. It was a good thing I printed out two copies as the first time my brush was too wet and it was a mess. Here is the card I came up with. The background is a photo I took while camping. I was in a hammock looking up through the trees. Since I decided my owl probably would not be out during the day I decided to turn the sky into sunset. I love how the gelatos are transparent so that the details of the trees shows through. 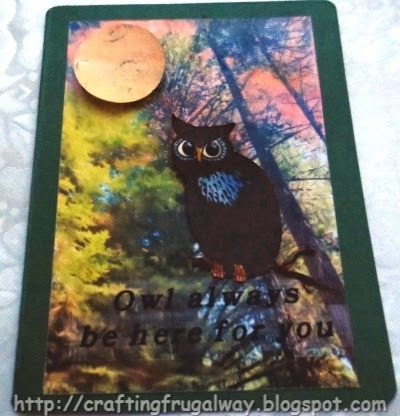 The owl is the same image I used on my altered card. I cut the tree off the image where the bat was hanging and flipped him so he is facing the other way. I used glaze pens for the beak and claws. Then once again I used Dimensional Magic for the eyes. I love the dimension it gives. I don't remember who showed me this trick but I used my tape runner to adhere the lower part and a foam dot for the head. I copied the owl with the moon and then sized him large enough so I could crop the moon portion into a circle shape. I didn't clean the brush well enough from applying the gelatos on the photo when I went to paint Champagne color on the moon I got some of that color. I love though how it looks. The moon is pop dotted. I think I've mentioned before that I hold stock in the company that makes those adhesive foam squares and circles. LOL! Since I don't have a sentiment stamp with this sentiment. As well as I'm too lazy to piece together cut out letters I used my Brothers Label machine. After I printed out the sentiment I brushed matte Glazon over the tape to cut down on the shine and make the label more transparent. I must confess that I haven't been mailing cards out the last couple of months. I was mailing out three or four cards a month for no reason at all to people. I hope the person who gets this card will like it. I'm off to look more through the library books. Wishing you Happy Frugal Crafting till we meet again! It is once again time to be posting Altered Cards. I can not believe that we are already into week six. This week I hardly had any of the supplies which were used. 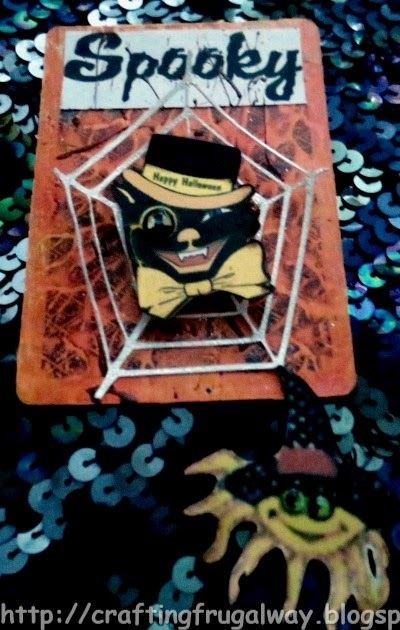 Hard as it may be to believe I do not own tissue tape, Washi tape, black embossing powder, or Halloween stamps. Nor did I have the cute napkin which Claudine used. I do however have a ton of Halloween images. Because I did not have the color mists which Claudine used I used my new airbrush. The background is gesso which I used crumpled foil on to get texture. I airbrushed it with Carmine Red and Orange. Then I used a stencil with Dusty Concord and Spiced Marmalade Distress ink. I didn't like how it looked so sprayed more Carmine Red. I saw a piece of sheer purple material which had been wrapped around fresh flowers at one time and laid it on top to see how it looked. I liked the look so glued that down. The images are from Dover Sampler. It appears that I pretty much have downloaded all the samples which they offer. 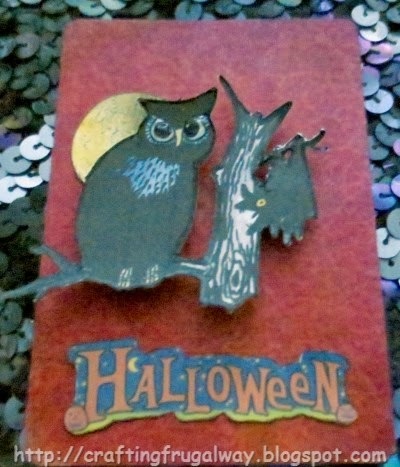 I made sure that the moon would cut separately from the owl when I traced it to turn it into a cutting file. The Halloween I've used before so I just needed to resize it for this project. For the moon I airbrushed it with yellow and black to give it a little more detail. The owl part I edged with my black Glaze pen. I used Dimensional Magic on the owl's eyes and was thinking after I got it all put together that I should have used a drop for the bat's eye as well. The owl is pop dotted for dimension. I used a stencil with the gesso for this background and when I pulled the stencil away it left large areas of the playing card back showing. I liked the look of it so left it. Since I wanted the background to show through and it was slick in those places I used some left over yellow finger paint. When the paint was dry I airbrushed Carmine Red over it. Then after having problems getting the orange pen to work with the airbrush I gave up and rubbed Spice Marmalade Distress Ink over it. I then splattered Red Oxide Paint. I need to do some more practicing there to get the paint where I want it to go. LOL! I don't know who shared the Spider web cutting file. I think it was Kelly from Finding Time to Create. The Cat is from Free Vintage Digital Stamp. The spider witch and the Spooky is from Dover Sampler. I heat embossed the spider web with Winter Wonderland embossing powder by Recollections. It gives it a nice sparkly look which unfortunately the photo does not do justice to. Mr. Cat is pop dotted on the web. I used a piece of the purple fabric on the black part of his hat to give it the look of fabric. Used Dimensional Magic for the monocle. Used a yellow Glaze pen to define the monocle frame and chain. Edged it with my old standby Distress Vintage Photo Ink. The spider witch is also edged with the ink and her eyes are also Dimensional Magic. I decided to have her hang over the edge of the card. I splattered red oxide paint on the word Spooky. I don't know why it looks gray in the photo. I'm thinking that these would make cute Halloween cards. So if I decide to make some Halloween cards I'll have to keep that in mind. I'm not sure what I'm going to be doing next but do come back and sit a spell. Wishing you Happy Frugal Crafting till we meet again! Hi everyone! Yesterday and today I played with my eBrush airbrush. I'm a loving it even though I need to practice more. Here is my first card. Mitsyana Wright generously shared the link to her site which has the file I used as a stencil.The file can be found here Butterfly Border. First I sprayed on a strip of paper the blue using my air brush. I thought the blue was too dark so inserted a cheap dollar store marker in the eBrush. I noticed when I was practicing on scrap paper it gave me a nice spattered effect so I went that route. Then I placed the negative over my background and sprayed my butterflies. I am still learning to get the spray where I want it so accidentally got color in some of the diamonds. I decided to use "Stickles" to color the diamonds. I then took a Glaze pen and colored the body and antennae of the butterflies. Since my cardstock is crappy this allowed me to fill in where the antennae had not cut out cleanly. Alas only the large butterfly cut out nice. I went ahead and cut another out of scrap cardstock. Airbrushed and used the glaze pen on those and pop dotted them to the card. I'm still learning how to get the spray where I want it. What distance to use as well as speed to use. I love how the top 3d butterfly turned out. Now if I can duplicate that effect I'll be happy. I stamped my sentiment on tissue paper and carefully glued it down. I definitely would recommend buying the eBrush if you are looking for an airbrush. I had originally looked at the Copic one but I don't have any Copic markers. The eBrush has adapters available which will fit most brands of markers. I found yesterday on clearance some Crayola markers which fit with the adapter I have. Now if I can find some glitter as well as metallic pens which will fit. Although I can buy Crayola Marker Maker kit and fill with my own ink. If you are interested in buying one of those WalMart online has them for half of what I've seen anywhere else. I believe that they also carry the refill kit but I'm not sure. O.K I'm behind on starting my altered cards for this week so I better get busy. Lol! The only supply I have which Claudine used was paint so it will be interesting to see what I can do. The theme is Halloween and I do have a ton of digital images so it will be deciding what to use. Thank you for stopping by and do come back and grab a cup of hot Apple Cider. Wishing you Happy Frugal Crafting till we meet again! 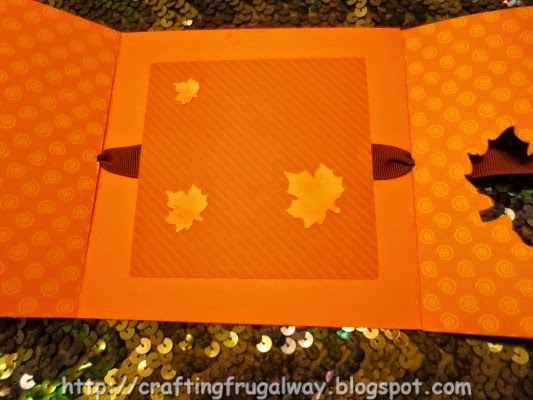 Jenn Mason shared on Scrapbook Soup TV which aired Friday how she makes these amazing cards with shapes cutout. She generously shared her template along with instructions. Check out episode 401 for instructions and the template on the web. I did some playing around with the template and now have a ton of leaves. LOL! As I had a difficult time getting the right placement. As it is I had one sheet of card stock down the wrong side on the cutting mat so the front ended up being a little different from what I had planned. I wanted the smaller leaves on one side of the front instead of having twin large leaves. I don't have 12 x 12 double sided cardstock. So I ended up using a couple of letter size pieces. I did use a scrap of a different pattern cardstock for inside. Once I got my maple leaves where I thought I wanted them and Cameron cut out the pieces I went to work putting things together. I decided to go with brown ribbon for a contrast. I think next time I will leave off the ribbon and have the front close with a loop on one side and a button on the other. Since I have lots of cut out leaves to play with I went and played with my new toy, Yes, I bought myself an early Christmas present an airbrush which just came in the mail yesterday. I used orange and yellow markers on the leaves. Of course I had so much fun that now I'm going to have to go and buy more colors.I did find out that the Crayola Markers will work so that is a cheaper alternative for me to get more colors. I can't believe how nicely the airbrush works with stencils. I was playing with some dollar store tissue paper and stencils. Thanks for stopping by and do come back and sit a spell. The tea kettle is always on and there is always a cup of coffee available if that is more to your liking. Right now I'm drinking an Autumn Blend of coffee with spices in it including of course cinnamon. Then it is off to play! Today is World Card Making Day so I decided to make a card. If you remember in the last post I was talking about using Distress Paint on plastic. I cut a circle out of the plastic that I had painted Distress Paint on with my fingers. However, I discovered that the paint scratches off. Also I had gotten glue on the front when I was gluing a gem ribbon and when I tried to wipe it off with a damp paper towel the Stazon Ink I used smear, Argh! I probably should have used Glazon as that probably would not have happened. So it was back to the drawing board. I did play with stamping with Distress Paint. I started out by making a circle window card base. Using a cosmetic square I rubbed in a circle some Teal Stazon Ink. 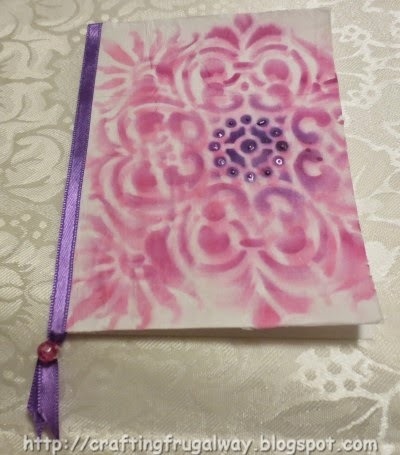 Then I went and used Stazon Cherry Pink ink with my lace background stamp. Because the stamp is so small I had to stamp twice using the stamp horizontally. I cut the butterflies out. I experimented with a technique I had seen about using washable markers and water. I didn't like how it turned out. So I used a yellow water color marker on these two. The reason I did them yellow is that the circle I was going to use had yellow in it. I then stamped with Stazon Teal ink using a flourish stamp and colored the body in with the brown marker. Then adhered them to the card with adhesive foam. The circle was stamped using Broken China and Pickled Raspberry Distress Paint. 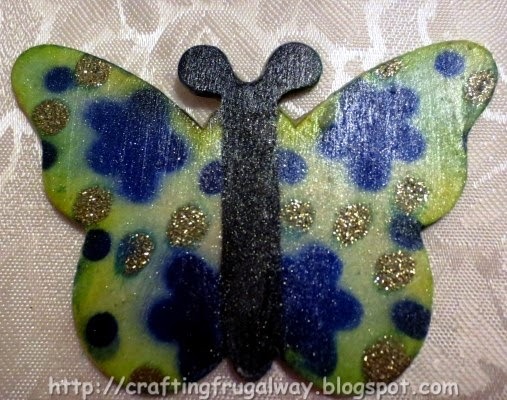 I was playing and can see lots of possibility using Distress Paints to stamp with. I could have put some Distress Paint on a mat and then used a brayer then placing the stamp in it like you would with an ink pad but I decided to apply it directly. The gem ribbon is suppose to be adhesive backed but the adhesive must have dried.Perhaps that is why it was on clearance several years ago. I have not seen any since although I keep looking. When I was playing with the gem ribbon I tried first to hot glue it onto the plastic. The glue dried too fast and I was unable to re-position if need be. I then went with tacky glue and that is when I got some tacky glue on the front of the plastic panel and messed it up trying to wash the glue off. So this time I applied the tacky glue directly to the ribbon. After the glue was dried I adhered the circle on the inside of the card. I hope if you made a card for World Card Making Day that you had fun. Although at times as things didn't work out as planned it was frustrating it was also fun to play. Off to clean off my area so I can play with my new toy that the mail carrier just delivered. It is an early Christmas gift to myself as I was not sure that the deal would still be available come Black Friday. Lol! Of course my justification is that it is for the grandchildren to play with. Thank you for stopping by and do come back next week to see what I come up with. I have not seen the list of supplies nor has anyone leaked what the themes will be for altered playing card. 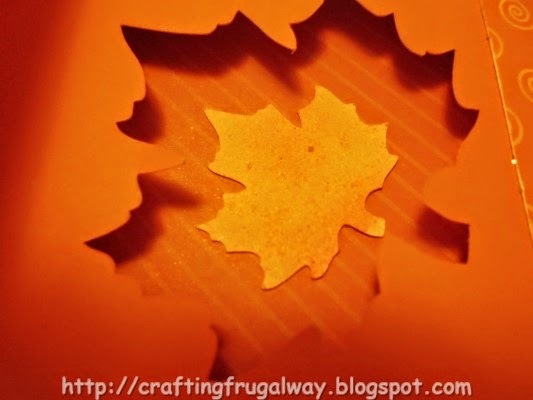 Wishing you Happy Frugal Crafting till we meet again!